Never write a number into a spot unless you are sure that's where it must go. There are only two possible ways that you can be sure. Either all other numbers are blocked from that spot, or that number is blocked from all other spots in an enclosing region: either column, row or square. The individual SPOTs are designated by labels like R2C3, for the spot in row 2, column 3. Spot R2C3 is part of SQUARE TL, the top left corner. TL, TC, TR, ML, MC, MR, BL, BC, and BR refer to the nine 3x3 square REGIONs. T, M and B refer to the three horizontal BLOCKs; L, C and R refer to the three vertical blocks. 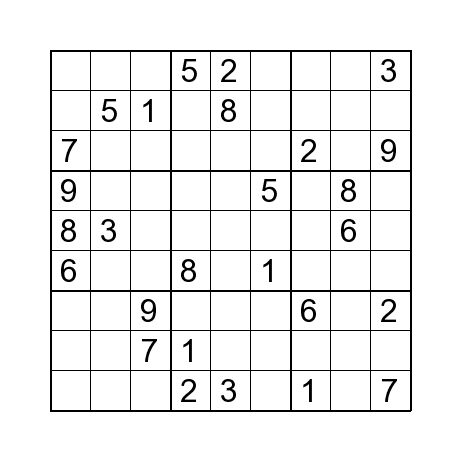 Each block contains 3 squares in a line, or 27 individual spots. Besides the SQUARE regions, we also consider each COLUMN and ROW as a REGION. A STRIP is a line of 3 SPOTS within one SQUARE. If any number appears exactly twice in a block, often the third spot may be deduced. In our example, a 2 appears twice in the top third. So in square TL, rows 1 and 3 may not have a 2. There is only one free spot in TL row 2; thus R2C1 must have a 2. Look for the fullest regions. If a row, column or square contains at least 5 values, consider the whole set of missing numbers and see whether any of their spots can be deduced. In our example, now square ML has 5 spots full. The missing values are 2,4,5 and 7. The strip of C3 within square ML is completely empty. A 7 appears in C3 in the square below, so the ML 7 must go in the only non-C3 empty spot of ML, namely R6C2. Scan the grid, concentrating on one digit at a time. Square TC needs a 1. The 1 is blocked from row 2 and columns 4 and 6, (because a 1 already appears in those regions) so the only possible spot is R3C5.